Basque is Brandt on bass and the voice of Maryasque. The instrumentation will grow and change but will always return to a simplistic origin. Basque was born in one of the noisiest cities on earth. In our quiet studio tucked away on 1/100th of an acre in the rolling hills of Brooklyn, NY: we create what is BASQUE. 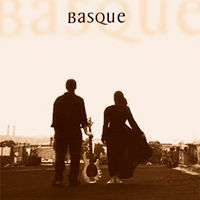 The aim of BASQUE is to give silence its place again in music- create space and let people's minds breathe. In a world filled with opinion and visual statements, we want to let the music speak for itself. To evoke emotion from the heart instead of the head. To create (dare we say it) something of beauty that inspires something in others.